It’s my sister Virginia’s (see her blog here) 24th birthday today, and I sort of promised her a birthday blog post. I’ve been pondering all day, and haven’t come up with anything worthy of her. But to summarize how much she means to me, and as a tribute to her many virtues…below is my Introduction to Ginny. Ginny is a really amazing person. She’s my best friend, my sister, my childhood buddy, my travel companion, and an example for everyone in her exuberance, creativity, compassion, and drive. I always joke that Ginny is the ‘next Martha Stewart’ because she always has new ideas, creative outlets, and the energy to accomplish all her goals and commitments. I mean, she’s not perfect, but she’s pretty close. And my mom calls her ‘Mom Number Three’ (myself being Mom Number Two, of course), because she grew up helping me be responsible for our rambunctious brothers (and we took/still take our job as older sisters VERY seriously). Ginny is really funny, a good storyteller, a faithful friend, and a tried and true sister. The mutual adoration and friendship thing hasn’t always been the status quo, however. Before Ginny was born, I had been AN ONLY CHILD (maybe also a slightly spoiled one) for sixteen months. So when my parents brought her home from the hospital, I was distraught. In fact, I broke out in hives and threw up. And when they put her in a tiny cradle and left the room, I apparently HIT her (this is only conjecture and family history I am repeating, of course), and then soothed her when she started crying, and repeated the process. BUT, soon afterwards I became fond of her, and even had a pet name for her. Donny. I can’t explain it. Virginia…Donny…doesn’t fit, I know. I tend to call her Ginny or Gin these days. We fought often as kids, but I think a perfect summary of our relationship is the example of separate bedrooms. When Ginny turned eight, she asked for her own room. We had always shared up until that point, and so she got her wish. It only took a few days for me to feel completely miserable. Ginny was fine (I think), but I was lonely. I packed up my blankets and tried to sleep on her floor. I think she eventually took pity on me and let me sleep in her bed, where my mother later found us and asked Why on earth wasn’t I in my own room? My answer summed it up: I just missed her. We still fought, and sometimes do even to this day, but each of us loves and misses the other, and there’s no doubt about that. 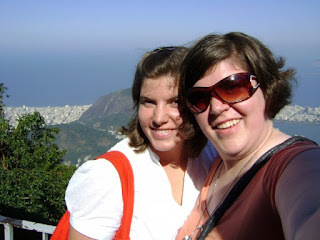 So…on to a Tribute of Ginny (and below, a photo of us in Brazil last summer). Ginny is really good (better than me!) at: scoring goals in water polo, swimming breaststroke, throwing heavy objects (shotput), teaching English, making money (and saving money), buying and wearing cool clothes, being creative (arts of all kinds), telling jokes, telling stories, being consistent in her spiritual devotions, making people laugh, spilling spaghetti sauce (oops! ), making fast friends really quickly, baking awesome chocolate chip cookies, playing video games, getting the boys to follow her directions, and lots of other things that I’m overlooking at the moment. But you get the idea. My sister = awesome, and I wish her a very HAPPY BIRTHDAY! i couldn'tve asked God for a more perfectly suited sister than you--even though we're not perfect.